Well, 9th November, 2010 was that momentous day, many have been waiting for. 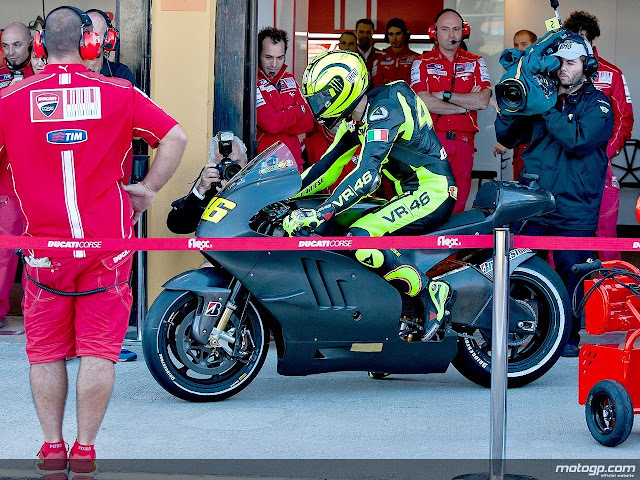 Valentino Rossi went astride a Ducati Desmosedici for quick 8 lap session for the first time after biding bye to the Yamaha YZR M1 just a couple of days back. 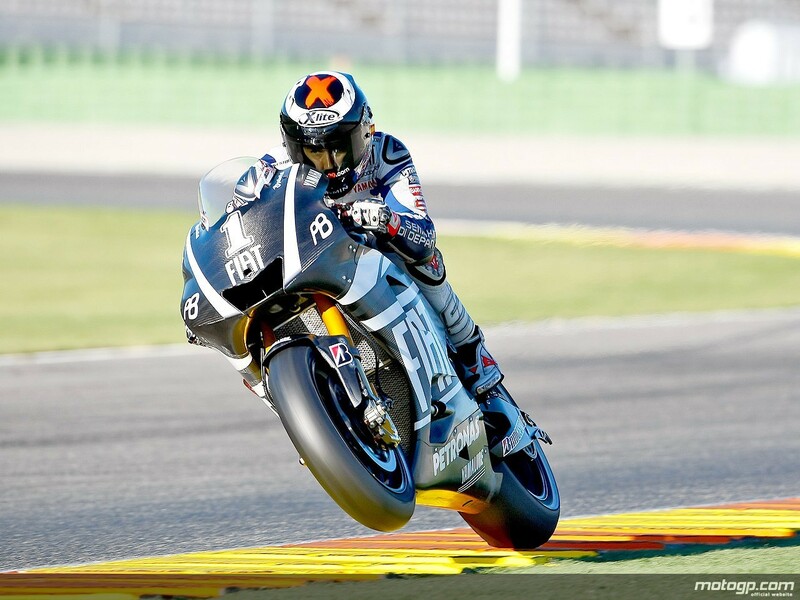 The main purpose of the test ride was to judge if Rossi would be comfortable with a screamer or the full blown GP11. 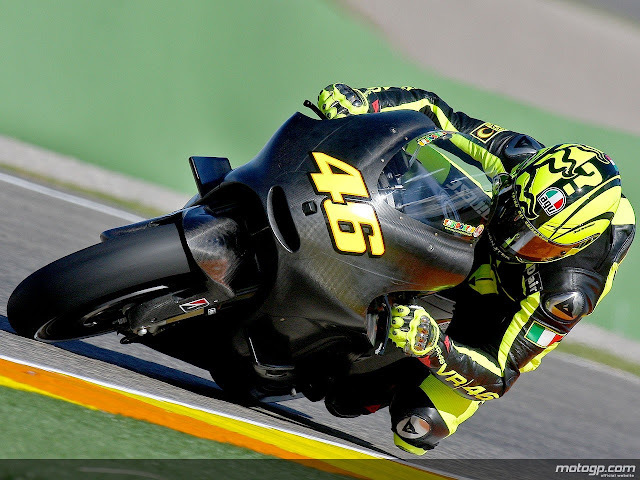 Donned in black with his trademark florescent Yellow touch up, Rossi looked anything other than the candid champ we are familiar with. Even the Desmosedici is all blacked up with a new fairing. As per MotoGP.com, Rossi's two day testing would end today, before which he needs to finalize which machine he would prefer for the coming season. Speaking of the day, day one of the testing, belonged to Lorenzo on his M1. What a season it has been for the Spaniard. I will be following too, as much as I can, like I have in the past. But I will not be gunning for anybody anymore. I liked seeing Rossi on the M1. Ps; The machine sounds wonderful! I won't be surprised if rossi and ducati both struggle in a way. the same happened to schumacher before and after Ferarri. a driver/rider can only be as good or bad as his machine. i hope the machine is good enough. You know what, when Rossi moved on from Honda to Yamaha, the Honda RC211V was considered as the GOD of MotoGP and it was said that Rossi's phenomenal career graph was because of the RC211V. But then he proved every one wrong by repeating the same performance in his opening season with Yamaha with then less potent Yamaha M1 seven years ago. Today Yamaha M1 is literally Rossi's brain child is one of the most sorted after MotoGP missiles (be it in 1000cc or 800). We are all excited to see how Rossi does on a very different genre of MotoGP tool like the Desmosedici BIG BANG GP11. I for one can vouch for the Desmosedici that it's like no other motorcycle out there.